A Spanish Mass setting for contemporary liturgy that is as powerful and upbeat as it is poignant and touching. For singer-songwriter Azeneth González, Santa Teresita del Niño Jesús (known by several names in English, including St. Thérèse of Lisieux) has always been an inspiration in both her simple way of life and her constant trust in God's will. Dedicated to this much-revered and holy saint, Misa Santa Teresita del Niño Jesús is a Spanish Mass setting for contemporary liturgy that is as powerful and upbeat as it is poignant and touching. Featuring a combination of ballad-like songs and pop rock styles, Misa Santa Teresita del Niño Jesús is one of the first complete contemporary Spanish settings of the Mass that OCP has offered to Catholic churches. Along with settings of verbatim texts from the Misal Romano for each of the Mass parts, this collection of church music also includes four stunning processional songs, one each for gathering, preparation of the gifts, Communion and sending forth. The guitar songbook provides guitar parts and three-part harmonies, while Azeneth's powerful vocals bring each song to life on the recordings. 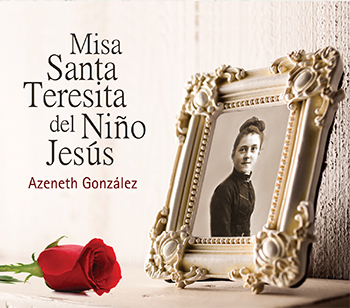 In writing Misa Santa Teresita del Niño Jesús, Azeneth was inspired by the enthusiasm and energy of today's youth in the Catholic community and, through it, she hopes to encourage more young people to continually seek to serve God and to live out his will. With current sounds and rhythms, this setting of liturgical music from one of contemporary music's most compelling Spanish singers is an ideal setting for contemporary ensembles at youth and healing Masses.